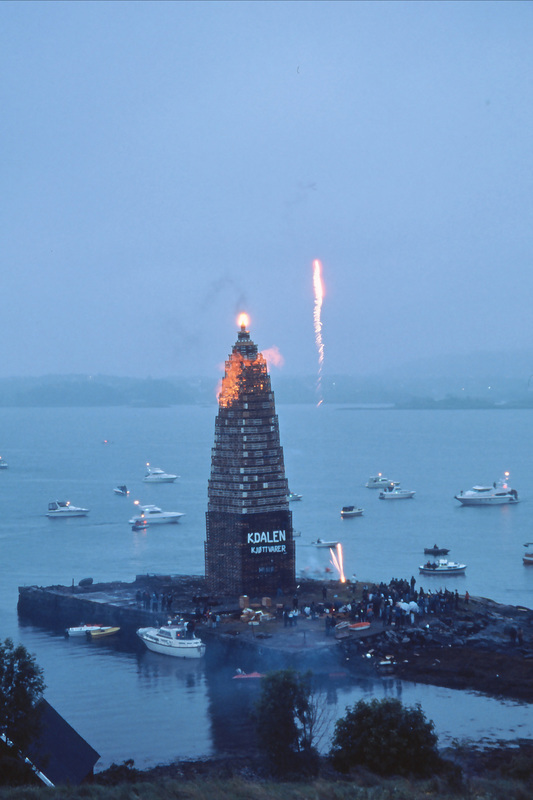 Each year wood is 'acquired' from all around the community to build the biggest-ever bonfire in honour of the patron saint, Saint Hans, (hence its Norwegian name, Sankt-Hans). This event marks the middle of Summer, the longest day and, traditionally, if crops were not planted by this day in the growing light of summer, then they would not produce a harvest. The tower is made up of wooden forklift packing pallets and cod liver oil barrels, similar to wine barrels. All are skew-nailed on top of each other to form the tower, but wait ... it's not hollow. From the bottom to the top, the inside is filled with anything wooden, or at least combustible, to form a solid burn-pile. On the evening of the fire, people come to view the ancient ritual, including this year, the QE2 on her final voyage to Norway. This particular year, of all the years in history, the locals running the event decided to light it up on Saturday evening, the weekend, instead of the actual date of Midsummer-Eve, so the kiddies could stay up late and watch. Now they built it, and they burnt it, and they had the right to run it however they chose to, but there were some who got their noses out of joint because of the change to tradition. I could tell by the people's opinion page, or rather pages, in the local newspaper around the time of the event. You see, the man who ran the local Tourist Bureau had organised the QE2 to be in Ålesund on that day, and she was expected to leave on the night of the fire. The tower was still in construction when she passed, leaving Ålesund forever with, you guessed it, no fire to mark her final departure. The man from the Visitor Centre screamed: "How dare you?" He was left with 'egg on his face', but, as the locals said in their defence, "We didn't see you out here passing up pallets" while they were constructing 'their' tower. They didn't tell him of the change of date, but then again, he didn't ask to confirm it either. 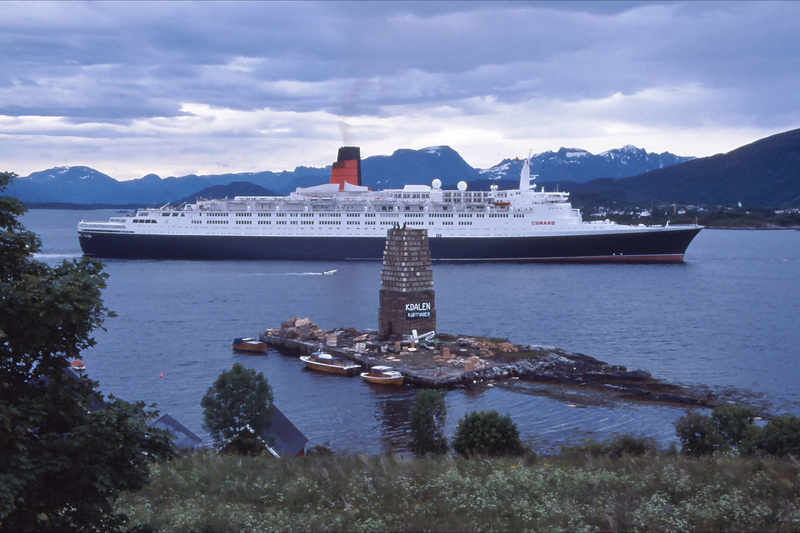 They hadn't known about the QE2 and nor was she any of their business anyway - they had a tower to build. 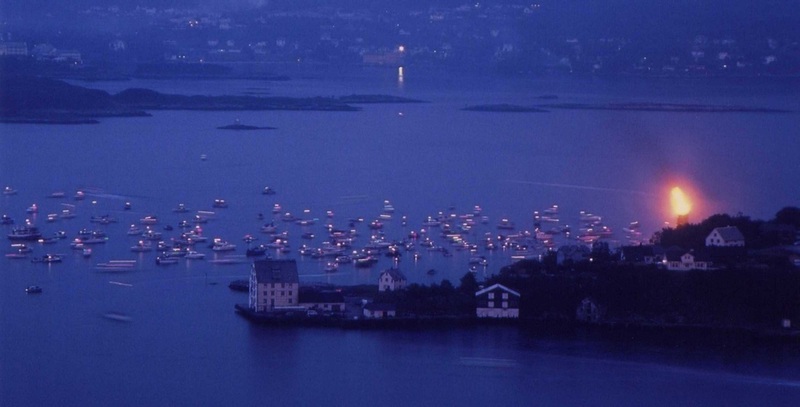 The QE2 departing Ålesund on Midsummer-Eve, forever and, with no fiery farewell. Below is the lighting of the bonfire on Midsummer-Eve - well, nearly. I'd been capturing images from the same position with the same lens for weeks documenting the progression of the tower's construction and, in time, its death by fire. However, on the fateful night of 'nearly Sankthansaften', it rained and ruined my plan. Not unusual for Norway in Summer, but I joined the ranks of those pissed off at the change of tradition by lighting the fire on the weekend for the kiddies. You see, it hadn't rained on the day of Sankthansaften and nor had it rained on that day in previous years. Like I said, those who built it had the right to choose when they burnt it, and, I have the right to say: "bastards!"